If you intend to be the future leader in puzzle sales you really need to take a look at this listing. Our products have proven sales and have pasted safety checks by major organizations and labs. Since they are designed to be promotional products insurance rates are very favorable. Puzzles with removable and replaceable outside skin that forms a remarkable three-dimensional jigsaw puzzle. 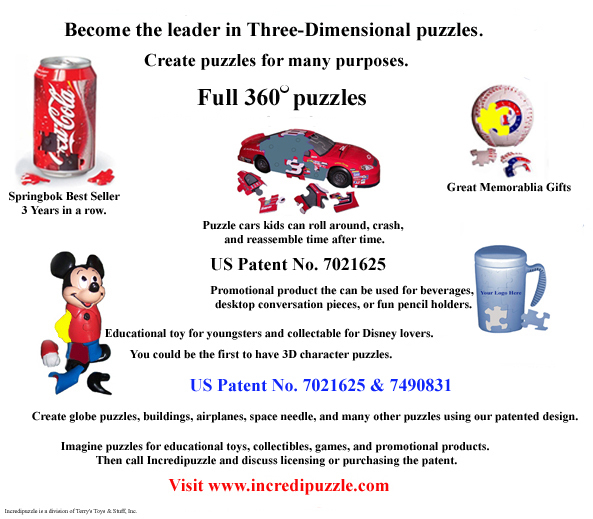 This offer consists of two US Patents and one US Trademark plus tooling for the beverage and baseball puzzles. Patent No. 7,021,625 protects a method of producing true 3D shaped puzzles that utilize an internal structure and retention pins to hold pieces in place. It also protects multiple methods of releasing pieces from the structure. US Trademark No. 78503895 protects the name and logo "Incredipuzzle", a name and logo chosen to market shaped puzzles of existing objects of all kinds like educational toys, promotional products, collectibles, and other retail products. Our puzzles have been on the market since the fall of 2004 without a single complaint, return, or insurance claim. These puzzles are safe and very durable. Page created at 2019-04-25 14:32:45, Patent Auction Time.